This is a review of the Bosch KEO Cordless Li-Ion Garden Saw, this model is a very lightweight, compact and extremely useful reciprocating saw that will prove invaluable in the garden. The fact that it is cordless, being powered by the brilliant Bosch Lithium-ion battery, means there is no worry that you will cut through a power cord and you have all the manoeuvrability you need for even the trickiest pruning jobs. In case you are not sure exactly what a reciprocating saw is, it is one where the blade cuts through the wood by means of a push/pull action of the blade. It is this action which is known as reciprocating. 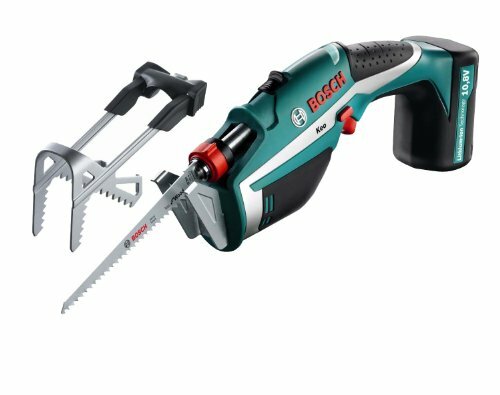 Bosch have created a range of reciprocating saws for many different types of work – you can view the range available at great prices from Amazon if you use the link. This particular Bosch reciprocating saw, is designed exclusively for jobs in the garden and is growing in popularity, judging by the amount of positive feedback I am finding online. One of the best things about this lightweight garden power tool is that it is powered by a rechargeable lithium- ion battery with all the advantages that this type of battery has over the traditional Nickel-Cadmium type. If you have not used tools with lithium-ion batteries before, you will soon be a convert. First of all, these batteries do not self-discharge provided that you store them in cool, dry conditions. This is a real blessing as there is nothing worse than deciding to get on with a job during a break in the weather – only to find you have to wait for the battery to charge! The other benefit is that there is no ‘memory effect’ as with earlier types of rechargeable battery. What used to happen is that each time you recharged a battery, it took a little less charge – making the time between recharges, shorter and shorter. This just does not happen with a lithium-ion battery, it recharges fully, ever time and can even be recharged as many as four times as often as the older type. Finally, they only take three hours to charge fully by means of a simple hi-fi charger – and they weigh only half that of traditional batteries but deliver all the power – you can see why I am a convert! This model has been cleverly designed by Bosch to fill the need created by a gap in the market -somewhere between a really good pair of secateurs and a chainsaw, for cutting medium sized branches that are too big for a pair of secateurs but which do not really necessitate the use of a chainsaw. Traditionally, this gap would have been filled by the purchase of a manual pruning saw. Now it is easy to cut those branches without the effort that using a manual pruner involved! The lightweight Keo features a uniquely designed A-grip hook that eliminates the need to have a second person providing a hand to hold otherwise unsupported branches during cutting. This is a big help. With the A-grip, you can cut through branches of 60 mm in diameter (that’s just under 2.5”) and where you do not need the A-grip, the diameter that can be cut rises to 80 mm, (that’s just under 3.25”). The blades on the KEO have all the precision you would expect from their Swiss manufacture and the SDS system from Bosch makes changing blades really simple without the need for any tools – it is a simple push-button operation. In addition, you can use the KEO for other cutting jobs whether in the garden or DIY jobs as the blade can be replaced with any of the blades in the ‘All Purpose’ range of saw blades from Bosch. These blades can be purchased in sets of three wood blades for the garden or five assorted for metal, plasterboard and, of course, wood. Also included in the set is a flexible blade to enable you to cut ‘flush’. I have to say that the KEO is a real pleasure to use and comes supplied with a full instruction manual. It has the ergonomic design that I have come to expect from my Bosch tools and it also has a soft grip handle which makes it not only comfortable to use, but you feel it is really secure in your hand when you are working. It is so lightweight and it is easy to use one-handed which is another big bonus. It only weighs 900 grams without the A-grip and only 1100 grams with it. As you would expect from Bosch, this is a well made tool, backed up with the Bosch two year guarantee which covers parts and labour. Best Deal? The Bosch KEO Cordless Li-Ion Garden Saw is currently 14% off at Amazon with free shipping! This entry was posted in Garden Saw Reviews and tagged Bosch garden saw, Bosch KEO, Bosch reciprocating saw. Bookmark the permalink.